Well, last week I told you all about the challenges I had just getting started with the MQG Riley Blake fabric challenge, and I was wondering if I was going to find a 3rd fabric blunder or not. Turns out, I sure did! 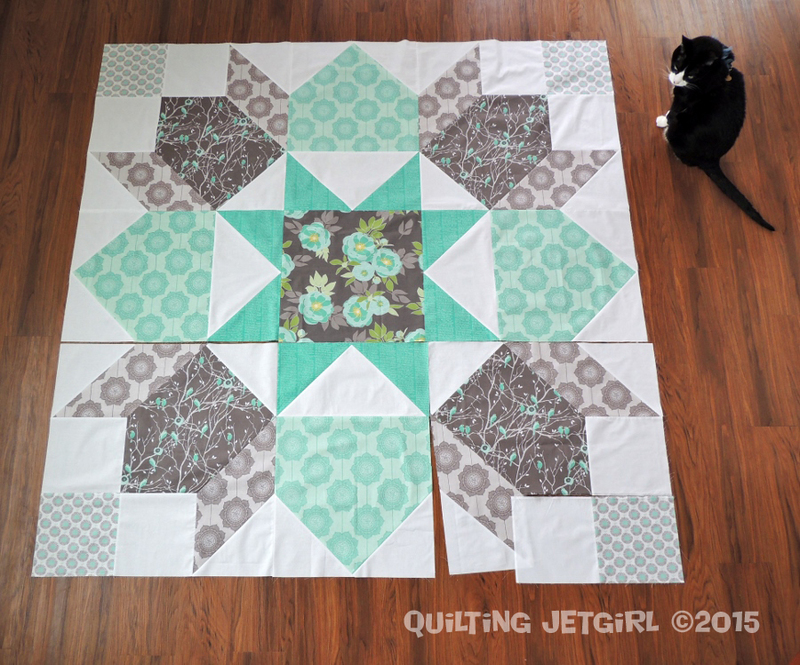 😉 It’s so obvious when I lay out the quilt top that even my cat, Puppy, can’t help but stare at the problem! 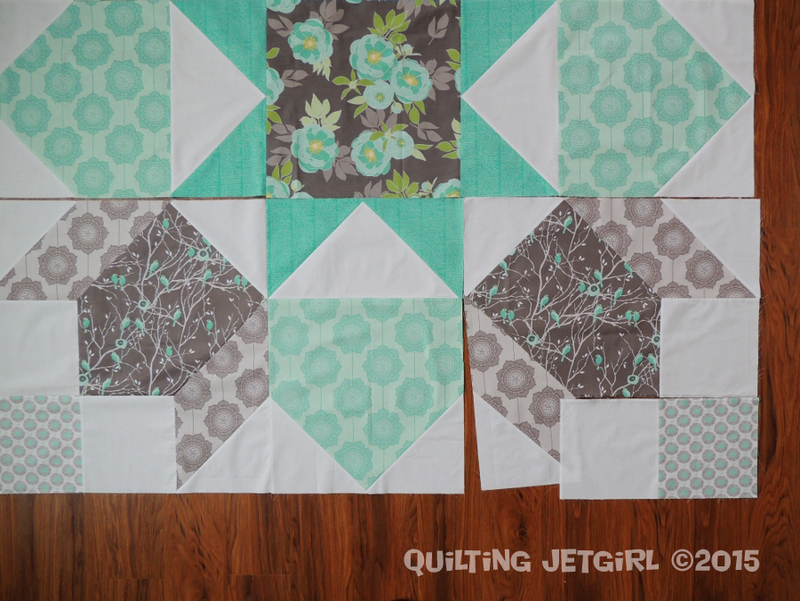 When I received the fabric order for the grey Cottage Wallpaper from Hawthorne Threads, I got right to work on finishing up the corner blocks and Y Seams for the quilt top. Everything went well until I got to the last Y Seam, and I realized something was seriously off with the last corner block. I took some measurements and realized that the 18.5-inch square of the bird print must have been originally miscut to have lead to such a seriously wonky final corner block shape. Laughing at myself (did I really just cause this to happen because I think mistakes come in 3’s?!?!? ), I scoured the internet for a store with yardage of both the grey bird and grey Cottage Wallpaper print and then set about sewing together as much of the quilt top as possible. All in all, I am really pleased with how the design is coming together. I just need a bit more patience and yet another fabric order to arrive before I can finish piecing the top! I’m crossing my fingers that it all comes together this time so that I can meet the July 15th 31st submission deadline! Linking up to Let’s Bee Social. I think it’s gorgeous, Yvonne. I hope you can get it finished by the deadline. I’d love to see how this stacks up to some of the other quilts in the challenge. 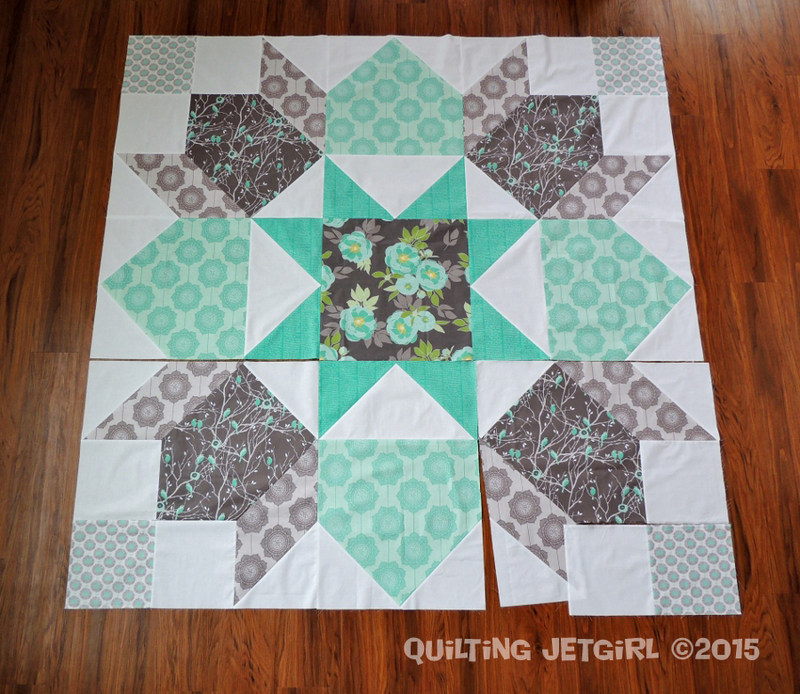 Despite the wonky corner, your quilt is looking amazing! I had a boss once that said once a project starts sliding sideways, it just keeps on sliding 🙂 My fingers are crossed as well hoping that you get your fabric and this lovely quilt is finished in time! This is such a beautiful design. So sorry it has caused you such heart ache. Here’s hoping your happy mail arrives quickly. I am so looking forward to seeing how you decide to quilt this! My fingers are crossed for you too, Yvonne! It’s coming along beautifully, even with that cursed trio of blunders! And wouldn’t you know it would be the last block too! It sounds like you are taking it well, with a little humor! I love how it has turned out! It’s looking good! I hope you get your replacement fabrics to fix the problem in time. You’re so right about the problems coming in 3’s. Maybe all the problems are occurring with this one project, and you’ll have several other projects that are problem-free! I’ve had such scares before, too, and it’s not fun. It’s wonderful to hear you talk about it realistically, and let others know it’s really just a bump in the road. Thanks for letting us all know about the deadline. I was under the assumption it was the 31st. My own is still a pile of fabric so I’d better get on it quickly. Wonky or not, I still love your design. I’m crossing my fingers with you. It’s great that you can laugh at your mistakes Yvonne. I’m glad you could still get more fabric. The quilt is looking great. I really love the fabrics and design you have created! I hope that everything arrives quickly and you meet your deadline. Thanks for sharing and have a great day! It’s like a comedy of errors! Glad you were able to find the fabric quickly this time, and that the deadline was extended! I know you’ll get it done in time! yay 🙂 Fingers crossed for you girl! Oh, I think my heart would just sink if I had gotten this far and realized that I had cut my fabric wrong and didn’t have enough to finish. Three mistakes… ouch! Lovely WIP… hope you can make your deadline! Oh, I feel for you, but I’m glad you were able to find replacement fabric. Here’s hoping the postal service will be swift. The block/quilt is looking beautiful. It’s such a peaceful pattern and color scheme despite it’s mischief with you. I think that, sometimes, the more a quilt tests us along the way, the greater the chance that we create something really special. Could be true here! I really like your design for the challenge! I am sorry for the blunders… They seem to always happen to me too. I have learned to buy more fabric than necessary for projects because I kept finding I was having to order extra anyway due to my mistakes! Now that’s just sad! Can’t wait to see your challenge quilt all finished! I really love all of these and the colors and think it will be well worth all the troubles. That is a stinker though! I just had it happen on a block and I didn’t realize I did it wrong until I LOOKED at the few pictures I took of it. Ugh. This is definitely going to be fabulous! I really like the design. I hope that the rest of the quilt goes more smoothly. My LQS has (or at least had a few weeks ago) almost all of the prints in the line so if you need any prints you cannot find online I can pick them up for you. Let’s hope that three is the charm and it all goes smoothly from now! At least you have yours almost finshed! I haven’t even begun mine…just got the idea while in Italy and am going to buckle down and get moving. I love the design, btw – looking really good. Mistakes happen, hey? It’s totally fixable, which is nice.